Rockwood Mansion, listed on the National Register of Historic Places, is an English Country Estate in America. The Mansion, built between 1851-1854, is an excellent example of Rural Gothic Revival Architecture. Rockwood Mansion was built for Joseph Shipley, a merchant banker originally from Wilmington. The Mansion was Shipley's retirement home. Shipley spent most of his life in Liverpool, England where he became wealthy. Rockwood Mansion was inspired by Wyncote, Joseph Shipley's English country house designed by George Williams. Shipley had Williams design Rockwood Mansion, though he had never seen the site. Joseph Shipley moved his entire household from England bringing his favorite dog and horse (Toby and Branker) as well as gardener Robert Shaw and housekeeper Audrey Douglas. After Joseph Shipley's death, Rockwood eventually became the property of his great nephew Edward Bringhurst Jr. in 1891. Bringhurst with his wife Anna and their three younger children Mary, Edith and Edward moved into Rockwood the next year. 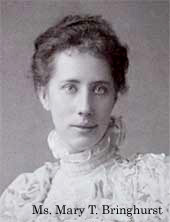 The Bringhurst's eldest daughter Elizabeth Bringhurst Galt Smith, affectionately known as Bessie, was married and living in a castle in Ireland at the time. Bessie was responsible for much of the decorative features of the Mansion during this period. The mansion currently represents the 1890s when the Bringhurst family moved into Rockwood, though much of Joseph Shipley's furniture (imported from England) is still is in place at Rockwood. The estate passed to Mary Bringhurst who lived to age 100, and left the mansion to her niece Nancy Sellers Hargraves, who left it to an unnamed non-profit for the enjoyment of present and future generations. New Castle County received the mansion and acreage in 1973. The mansion was extensively restorated by New Castle County in 1999. The 72 of the acres of Rockwood Mansion Park includes the Mansion & Conservatory, Porter's Lodge, Gardener's Cottage and Barn & Carriage House currently which was restored and converted into a catering facility "The Carriage House" which is leased out for receptions and meetings. The 6 acre historic garden of Rockwood is surrounded by a ha-ha (a sunken wall used on English estates instead of a fence to keep livestock away from the house, so it appears that the lawns are continuous). The landscape is referred to as Gardensque, a style that is characterized by long vistas, curving paths, and trees and shrubs bordering the lawn. The parlor rooms are lavishly furnished with period pieces and fine examples of English, Continental and American decorative arts from the 17th and 19th centuries.> The gardens are comprised of six acres of exotic folliage and a conservatory filled with examples of Victorian flora. Some of the specimens in the garden are just incredible in terms of size. Pine trees near the mansion must be 200 years old and there are rhododendrons that are as big as small houses. $5 adults, and $2 children for DE residents, $10 adults, $4 child for out of state visitors. Military personnel are free. The Gift Shop is open 10am - 2pm, and offers coffee, tea, beverages, sandwiches and sweets. The Park has lighted walking trails, and the park is open dawn to dusk, daily. Trail maps and self-guided Historic Landscape Garden tour brochures are available at the mansion Wednesday - Sunday 10am - 2pm. The Mansion is closed on major holidays. Entry to�Rockwood Park�is free. Museum admission is�free�the first Sunday of every month. Partially accessible to the visitors with disabilities. Gift Shop is open Weds. - Sun.,10am - 4pm. The shop sells gifts relating to the Victorian era. From I-95 South: Take exit 9 (Marsh Rd. exit). Make a left at the light onto Marsh Road, and immediate right onto Carr Road. At second stop sign turn right onto Washington Street Extension. Go though traffic light, and make an immediate right into park entrance. Park at lower lot for walking trails, or drive up the hill to Mansion parking. I-95 North: Take exit 9 (Marsh Rd. exit). Bear right from exit onto Carr Road. Make a right at the stop sign onto Washington Street Extension. Go though traffic light, and make an immediate right into park entrance. Park at lower lot for walking trails, or drive up the hill to Mansion parking.